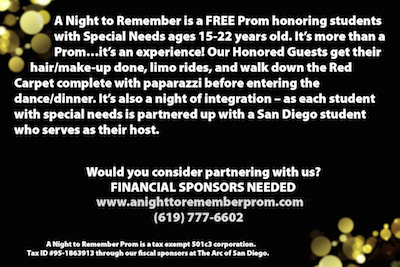 A Night to Remember is a FREE Prom honoring students with Speical Needs ages 15-22. It’s more than a Prom… it’s an experience! Honored Guests get their hair/make-up done, ride in limos and walk down the Red Carpet complete with paparazzi before entering the dance/dinner. It’s also a night of integration – as each student with special needs is partnered up with a San Diego student who serves as their host. As of Feb 20, A Night to Remember is looking for 100 more Honored Guests.